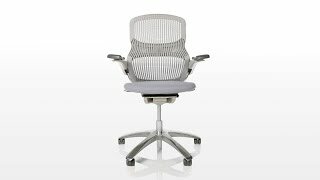 Promote better posture and increase productivity with the simple addition of the Knoll Generation Chair to your office. The Generation Chair by Knoll is a dynamic desk chair that can make all of the difference at work, starting with its revolutionary high performance Flex back, which reinforces the body and back in any position. It's tried-and-true lumbar support that you can count on everyday. This flexible and progressive ergonomic chair uses a breathable elastic material to make up its unique back, and maintains proper airflow as it flexes with you throughout your range of motion. The Knoll Generation Chair's durable back material does not crumble or sag over time, giving you a reliable chair that ideally supports your shoulders, lumbar area, and spine for better working comfort. Height range 39.25" - 44.5"
Glides reduce height by 0.25"
Arm height range 22.75" - 32.5"
Select either a plastic base to match the frame color or a polished aluminum base. This padded lumbar support moves up and down within a 2.5" range to accommodate a variety of users. Dark and light frame finishes are available. The back of the Knoll Generation Chair is made of a high performance elastomer. This durable back provides dynamic support that responds to users' movements. I recently received one of these chairs at work and have to say I am incredibly unsatisfied with it. Previously I was spending my day in a semi-comfortable chair and then having some back issues when I would fight crime at night. I requested a better chair for <reasons> and was given this stylish devil to help me out. At first I was highly satisfied with it, but then I started to notice a decline in my super powers. I assumed it was just my old age, but within a few days they were all but gone! No longer can I shoot laser beams from my eyes or scale large buildings with just the might of my calves. I've since had to move to a standing desk to get away from this awful thing, and my powers are returning slowly but surely. I am a computer programmer and work from my house several days a week. I wanted to make an investment on a very high quality "perfect" chair. This is almost it. I have owned the chair since early May 2011. It is indeed very comfortable. I really appreciate the way the seating surface and back support give and move with the way you are sitting. It certainly makes a long day so much better than a cheaper chair. I only gave it four star simply because of the price to own the chair. It took over 6 weeks for delivery (made to order I suppose). The fit and finish isn't exactly what I would expect on a chair of this caliber. There are several sharp edges on the seat bottom and the arm rests don't adjust very easily (behave like they need lubricant). Don't misunderstand it's not poor craftsmanship. I think it just needs some polish and refining. Then maybe it will be the perfect chair. Had my knoll generation chair for about a month and my only complaint is that I didn't order the super adjustable arms. I'm all over the place in this chair - dig the flexible back... just wish I had gotten the arms that move around more to work with me sitting sideways, backwards, etc. Chair looks great in my office, and it's the most comfortable chair I've owned - well worth the wait.